The new paperback -as bright on the cover as the hardback. There are still many cats and dogs – and budgies. 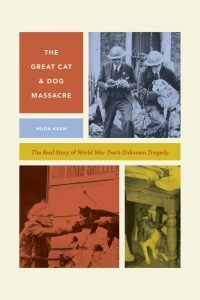 Last year my book, The Great Cat and Dog Massacre , was issued by the University of Chicago Press. It’s about the forgotten tragedies of at least 400,000 cats and dogs being killed by some of their owners in Britain at the start of the Second World War in September 1939. Although the war is often described as a ‘People’s War ‘ the actual circumstances around animals are virtually forgotten . I worked on new research from animal charities, state archives, diaries and family stories to bring a different story to light. Much had been reported in 2017 in various newspapers and magazines both in the USA, Britain (and even Der Spiegel and The Week). It was also reported online and has been shown on the University of Chicago Press website. In the index are the specific names of 52 dogs and 36 cats within the book that I have included. It seems somewhat unusual in forms of historical books! The paperback now costs less than £13 or $25 (depending on where you live).